NEW YORK – Craig F. Starr Gallery is pleased to present John Baldessari: Paintings 1966-68, on view from April 7 through May 20, 2017. The exhibition brings together a selection of John Baldessari’s (b. 1931) paintings from 1966-68 and includes examples of the experimental, small canvases and the larger Text and Photo-Text Paintings. It is the first focused presentation of these groundbreaking works since they were originally shown together at Molly Barnes Gallery in 1968. Among the earliest examples of Conceptual Art, it was with these seminal paintings that Baldessari reconsidered the practice of artmaking, questioned the concepts of authorship, originality, and aesthetic judgement, and first explored the narrative potential of imagery and the associative power of language that continues to inform his work today. By the early 1960’s, Baldessari had abandoned the concept of traditional painting. Working in his hometown, National City, CA, he was isolated from but not ignorant of the critical discourse happening in New York and Los Angeles. With this isolation came the freedom to experiment and ideas took precedent in his work. In 1966, Baldessari began a varied series of small paintings. A few featured just words painted on raw canvas. One of only two surviving examples from this small subset of work, Space Available (1966-67), will be on view. The work is literally read – “Space available.” – the subject matter is both advertising jargon and an accurate description of the what the viewer is looking at, meaning the canvas is available space in which to contain or depict art. Because the words are on canvas, Baldessari ensures the artistic nature of the work while experimenting with text as a new media of representation. Other paintings from this experimental group featured black-and-white photographs, which using a then novel liquid photographic emulsion process were printed directly onto the canvas. Baldessari’s idea that word and image could possess equal weight led him to make works combining text with enlarged grainy photographic images. The smaller paintings developed into the larger Text and Photo-Text Paintings (1967-68). For these works, Baldessari further removed himself from the actual making of the work. The texts were selected by the artist and painted by a professional sign painter. The photos in the Photo-Text Paintings were either “originally taken for nonart use” or “taken to violate then-current photographic norms.” For example, in Born to Paint (1966-68), which is an assemblage of panels that are studies for the painting Wrong (1966-68, Los Angeles County Museum of Art), Baldessari was photographed standing in front of a tree that looks like it is growing out of his head. Other Photo-Text works continue the National City paintings on a larger scale, while in A 1968 Painting (1966-68) Baldessari photographically appropriates a work of art, a painting by Frank Stella, and includes an eponymous and self-descriptive text below. Baldessari said, “I sought to use language not as a visual element but something to read. That is, a notebook entry about painting could replace the painting...I was attempting to make something that didn't emanate art signals. The only art signal I wanted was the canvas...[it was] important that I was the strategist. Someone else built and primed the canvases and took them to the sign painter, the texts are quotations from art books, and the sign painter was instructed not to attempt to make attractive, artful lettering but to letter the information in the most simple way." John Baldessari: Paintings 1966-68 is comprised of loans from the Glenstone Museum and private collections across the country. A fully-illustrated catalogue will be published and will include a new essay by John C. Welchman, author and professor of modern and contemporary art history and critical theory at the University of California, San Diego. "John Baldessari." Interview by David Salle. Interview Magazine. Brant Publishing, 13 Oct. 2013. Web. 02 Feb. 2017. Jones, Leslie. “Art Lesson: A narrative chronology of John Baldessari’s life and work,” in John Baldessari: Pure Beauty. Eds. Leslie Jones and J. Morgan, pp. 45-60. (Exh. Cat., Tate Modern.) London, 2009, p. 49. Tomkins, Calvin. “No More Boring Art.” The New Yorker. Conde Nast Digital, 10 Oct. 2010. Web. 24 Feb. 2017. Pardo, Patrick, and Robert Dean. 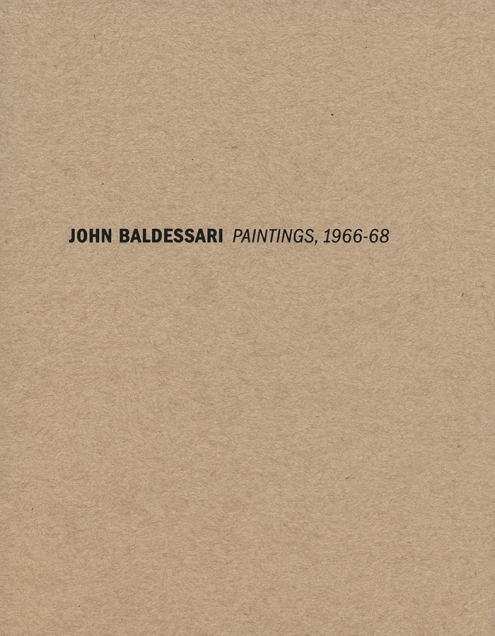 John Baldessari : Catalogue Raisonne, Volume I: 1956-1974. New Haven: Yale UP, 2012, p. 376. J. Baldessari quoted in Jan Debbaut, ed., John Baldessari, exh. cat., Van Abbemuseum, Eindhoven & Museum Folkwang, Essen, 1981, p. 6. Drohojowska-Philp, Hunter. “The Boring and the Beautiful.” ArtNet. 2016. Accessed February 12, 2017.